Can be sheared after blooming for new growth. Spectacular in large masses. 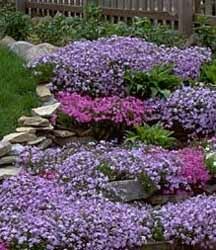 Also known as moss phlox, this is an excellent species for rock gardens and walls with its low (4 inch) creeping habit. Masses of small flowers appear in early spring. A well-established planting will appear to be a solid blanket of color. The foliage consists of closely set, tiny, needle-like leaves that remain green and attractive year round. After the flowers fade the tops of the plants should be sheared back about halfway; the plants then produce fresh foliage and may blossom again sparsely in the fall. Set plants 10 to 12 inches apart. New plants can be started easily from stem cuttings taken in the summer or from divisions taken after flowering. Before planting divisions, cut back the foliage to lessen stress on the sparse root system.